Geotimes - July 2008 - Meteorite Strikes Peru! Meteorite classification — what’s in a name? 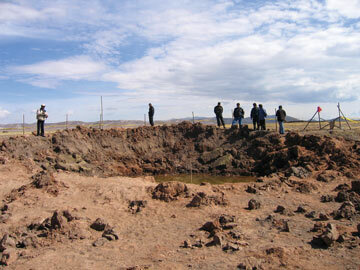 The meteorite that struck Carancas, Peru, left behind a 13.5-meter-wide crater. It was an ordinary Saturday morning in Carancas, Peru, a small village along Lake Titicaca only a few kilometers south of the Bolivia-Peru border. Residents of this indigenous rural community were going about life as usual, tending to llamas and sheep, chatting with neighbors in the native Aymara language and preparing for lunch. Little did they know that their lives were about to change. 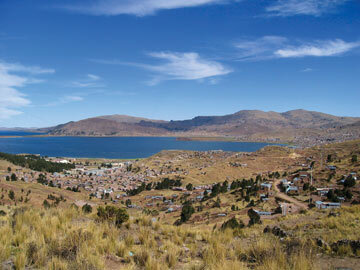 At 11:45 a.m. on Sept. 15, 2007, a fireball as bright as the sun appeared in the sky above the southern end of Lake Titicaca. Thousands of observers across the region saw it flash across the sky and heard loud explosions. The fireball struck Earth right in Carancas. The nearest eyewitnesses were only 300 meters away when the final impact hit and exploded. The event blasted out a nearly circular crater with a diameter slightly longer than a school bus. The explosion was violent enough to hurl ping-pong ball-sized fragments of mud up to five centimeters in diameter as far away as 200 meters and punch a hole in the roof of an adobe dwelling 150 meters away. Those closest to the fireball reported seeing white smoke rise from the crater and smelling foul, sulfurous odors. About two dozen people in Carancas sought medical attention following the impact, with complaints ranging from headaches to intestinal problems. Then the pandemonium set in. Not long after the meteorite struck the ground, word of the event spread like wildfire through the Internet and media. “METEORITE CRASHES INTO PERU: SCORES ILL” read headlines worldwide. To hear the media tell it, some 600 people fell ill from toxic fumes released by a gigantic meteorite that left behind a gaping, 30-meter-wide crater in this sleepy mountain town. In reality, the gaping crater was less than half the size widely reported. And the few short-lived symptoms reported by townsfolk were more likely the result of the emotional shock or concussive force of the massive explosion, rather than toxic gases. Nonetheless, for a brief period, this rural community was in the global media spotlight. That waned quickly, but interest in the crater was only starting to blossom among scientists and treasure-seekers. 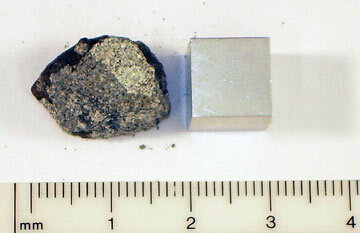 Fragments of the Carancas meteorite, such as this one, range in size from a couple of millimeters to about the size of a racquetball. Within 36 hours of the strike, geologists from INGEMMET (Peru’s geological survey) arrived in Carancas to study the crater. They were followed over the coming months by an onslaught of geologists — and collectors hoping to capitalize on the impact by finding pieces of the meteorite to sell. For scientists, this presented an incredibly rare opportunity: the chance to study fragments of a meteorite and a fresh impact crater. We could not pass it up. Aspects of the Carancas event are both common and rare — which is part of the reason we scientists were so keen to study it. When the meteor entered Earth’s atmosphere, it moved with as much energy as about 100 tons of exploding TNT, more than any non-nuclear military bomb. Space scientists estimate that meteoroids with similar energies enter Earth’s atmosphere approximately once a week. Roughly three-quarters of them go unnoticed as they occur over the open ocean. Only a few would produce craters of any significant size if they struck land. As a result, documented crater-producing impacts from any type of meteorite are very rare within a human lifespan. However, one such impact occurred in February 1947 over the former Soviet Union. A meteorite that had perhaps 100 times more energy than the Carancas meteorite fell through the atmosphere to Earth. The Sikhote-Alin meteorite fragmented into pieces, producing a field of craters. The largest was double the size of the Carancas crater. Another impact near Sterlitamak in Russia on May 17, 1990, produced a crater more similar in size to the one at Carancas. Both of these impactors were iron meteorites. Carancas, however, is a stony meteorite called a chondrite, which is perhaps the most astounding aspect of this event, as chondrites usually break up in the atmosphere. Surviving fragments fall to Earth at less than the speed of sound (340 meters per second at sea level) and rarely have the energy to make craters. The largest intact stony meteorite ever recovered as one intact specimen occurred as part of the Jilin, China, meteorite shower in 1976. It weighed more than 1,700 kilograms. In that case, however, the crater was only two meters across. In all, researchers have identified nine small craters (10 to 100 meters in diameter) on Earth prior to Carancas (there are other larger craters as well). Seven of these occurred during the last 10,000 years, and the other two occurred sometime during the last several million years. All were produced by iron meteorites, except Carancas. The indigenous Aymara people were going about their business, tending to livestock and visiting with neighbors when the meteorite struck. It did not take long for the local people to realize that this was a meteorite impact and to comb the ground for meteorite fragments. The finds proved to be a bonanza for some lucky individuals who sold pieces for hundreds of dollars to professional meteorite hunters descending on the site. Samples were on sale on the Internet within a month of the event — in fact, a quick search of eBay shows that some of these meteorite fragments are still for sale. Fortunately, locals and meteorite hunters also provided samples to researchers. Luisa Macedo, an INGEMMET geologist, traveled to Carancas from Lima to investigate the event and collect meteorite fragments for study. Back at INGEMMET’s laboratories, Macedo’s staff cut the samples into thin, polished sections for microscope study. That’s when they figured out it was a chondrite. The thin sections revealed that the Carancas meteorite was dominated by the same silicate minerals, such as pyroxene, olivine and feldspar, that are common in volcanic rocks on Earth. There were also bits of minerals rich in iron and nickel along with traces of iron sulfide, chromite and metallic copper. Macedo’s findings were released on the Internet only six days after the impact. When samples reached the United States about two weeks later, the general chondrite classification was more precisely defined by a team from the Lunar and Planetary Laboratory at the University of Arizona in Tucson led by Harold Connolly. The meteorite was officially classified as an H4-5 S3 W0 breccia in the complex classification scheme that scientists use and given the name Carancas by the Nomenclature Committee of the Meteoritical Society. Since the initial observation, planetary scientists have carried out extensive research on the meteorite and its crater. We have been able to further establish limits on the range of mass, velocity and impact angle responsible for forming the Carancas crater. As meteoroids pass through the atmosphere, they progressively vaporize and rapidly lose mass (a process called ablation) due to high temperatures generated by frictional heating. This heat also creates light, causing the meteoroid to streak across the sky like a giant fireball. Given the trajectory calculated for the Carancas meteoroid from infrasound data, it would have had an initial mass of six to 10 metric tons when it entered Earth’s atmosphere. Most of this mass ablated as it traveled through the atmosphere. The remaining kernel that struck Peru is estimated to have had a velocity in the range of 5,400 to 14,000 kilometers per hour (about five to 12 times the speed of sound) and a final mass upon impact on the order of a few metric tons (one to two cubic meters in volume). 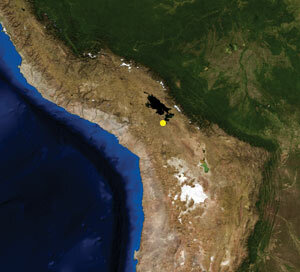 Meteorite impact location in the southern highlands of Peru. Although the crater was the size of a suburban house, it is inconsequential compared with great impact craters such as the Chicxulub crater that underlies portions of the Yucatan Peninsula — and which is tied to the dinosaur extinction 65 million years ago. Scientists estimate that 180-kilometer-diameter crater was created by the impact of an object about 10 kilometers in diameter — 5,000 to 10,000 times larger than the diameter of the Carancas meteorite. The 13.5-meter-wide Carancas crater spans an ancient lake floor and the channel of an ephemeral stream. It is almost perfectly round. Almost immediately after the impact, the crater filled with water because of the area’s shallow water table. This caused the wall of the crater to collapse inward so that the actual crater depth was not immediately evident. A couple of weeks after the initial impact, Walter Pari of INGEMMET crisscrossed the crater with ground penetrating radar, revealing that the sediments underlying the crater were cracked and strongly deformed to a depth of four meters, and more gently disturbed to a depth of seven meters. The ejecta thrown from the crater reached several hundred meters away and consisted mainly of lakebed sediments mixed with some fine meteorite fragments. Steam rose from the crater for perhaps half an hour after impact (estimates vary) and a small mudflow spilled from the crater into the ephemeral stream. Witnesses said the steam reeked of sulfur. The foul sulfurous odors and white smoke (or steam) reported by Aymara villagers immediately after the impact led some scientists in the United States to initially dismiss the event as some form of volcanism rather than a meteorite impact. However, the mathematical analysis of the infrasound records suggests that the impact was equivalent to the detonation of two to three metric tons of TNT, and an explosion of this size releases considerable heat. This explains the steam that was observed rising from the crater after impact. The mudflow that spilled out of the crater was likely also driven by thermal expansion due to the release of heat during impact. The heating of fetid and anoxic mud from below the water table was likely the source of the foul, sulfurous smell coming from the steaming crater. Similar post-impact mudflows from craters have also been observed on Mars, a planet shown to have evidence of water in the past. But one puzzle remains. Why did the meteorite, which entered the atmosphere at an acute angle, make a round crater? For anyone who has lobbed a rock into a mud puddle at such an angle, this seems to defy logic — the resulting crater of such a hand-thrown rock is obviously elliptical. In fact, until the 1950s, many astronomers argued against an impact origin for lunar craters for the same reason. They reasoned that because about 94 percent of lunar craters are circular and meteoroids should strike the moon at all angles (45 degrees is the most probable), then such impacts could not make such a high percentage of circular craters. The answer was worked out by researchers in other fields: At the high speed of a meteorite impact, the crater is opened by, in essence, an explosion. Information concerning meteoroid shape, size, density and angle of approach is mostly lost in the final crater form, which is almost always circular. 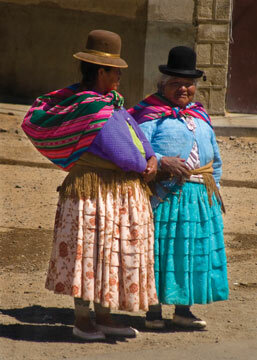 The meteorite struck Carancas, Peru, a village high in the Peruvian Altiplano about 10 kilometers from Lake Titicaca. The one artifact of the trajectory of impact that is preserved is the distribution of ejecta. Based on other impacts, we know ejecta is concentrated on the sides of a crater opposite to the direction of the meteorite’s travel (on the west side of the crater for a meteorite that traveled east to west). The distribution of the Carancas crater ejecta is broadly consistent with travel from east to northeast. The meteorite impact at Carancas was a lucky surprise for scientists. It is not clear how a chondrite, a relatively weak rock, traveling at least at four times the speed of sound, was able to survive passage through Earth’s atmosphere intact and impact the planet, but it did. One answer may lie in the high elevation of the Peruvian Altiplano — about four kilometers above sea level — where the meteorite landed. Had the impact occurred closer to sea level where the atmosphere is much denser, the velocity of the impact would have been slower and the crater considerably smaller. Although able to destroy an area up to the size of a city block, meteorites the size of Carancas often fly under the radar screens of astronomers who search the skies for potentially hazardous objects. 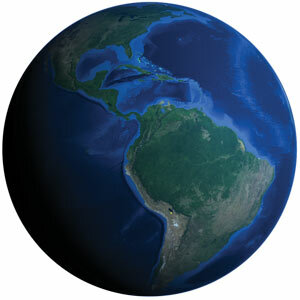 For example, although the Catalina Sky Survey at the University of Arizona Lunar and Planetary Laboratory can detect small Near Earth Objects that they call “flying couches” — so named because they are roughly the size of a couch — the world’s asteroid surveys can’t cover the whole sky every night, so some may go unnoticed. Therefore, the goal is to locate the much larger Potentially Hazardous Asteroids long before they threaten Earth. Potentially Hazardous Asteroids have the potential to destroy whole cities, create tsunamis or even threaten civilization. We can all be thankful that our atmosphere is always on guard to largely shield us from weekly craterings by “flying couches” from space. Of course, the Carancas fireball is one of the rare exceptions. 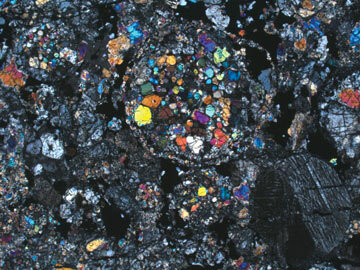 This color, cross-polarized light image of a thin section of the Carancas meteorite shows two large chondrules and the outlines of several others with less well-defined outlines. A falling space object is not called a meteorite until it strikes the ground; before that, it is regarded as a meteor, meteoroid, asteroid, comet or a fireball, depending on its size, provenance, brightness and if and/or when it enters Earth’s atmosphere. Once it impacts Earth, only a meteor or meteoroid becomes a meteorite. (An impact from a comet or asteroid would simply be called an “impact,” but we won’t get into that.) But once space scientists determine that a meteorite has struck ground, the classification doesn’t end there. The next step is to group meteorites into one of three self-explanatory classifications of iron, stony iron or stony meteorites. After that, subclassifications become extremely complicated. The family of stony meteorites — the most common type and what Carancas is — is subdivided into chrondrites and achondrites. Chondrites contain “chondrules,” previously molten droplets of silicates that are among the earliest and most primitive (unchanged) solids that formed in the solar system. Chondrules formed in the inner solar system about 4.5 billion years ago, before the birth of the planets, while the early solar nebula was still condensing. Achondrites are essentially rocks that lack chondrules. They may be fragments of former chondrites that have been highly modified by subsequent melting within their parent asteroid, or fragments of the moon, Mars or other planets that were flung into space by meteoroid impacts on those bodies. The well-known Alan Hills 84001 meteorite found in Antarctica in 1984 is an example of this type of meteorite: It was likely thrown into space from a meteorite impact on Mars about 15 million years ago. Carancas was classified as “H4-5 S3W0.” H4-5 means that the meteorite is an ordinary chondrite (stony meteorite) containing chondrules approximately one millimeter in diameter. The H refers to the high total iron content in the chemistries of the olivine and pyroxene minerals in the meteorite. The cobalt in the iron-rich mineral kamacite is also used to aid classification. The 4-5 refers to the rock type. This assignment indicates preservation of the chondrules and degree of thermal metamorphism. It is based on the microscope study of the chondrule boundaries, range of chondrule types observed and the statistical deviation of chemical compositions of olivine and pyroxene. In summary, the Carancas meteorite is structurally a breccia (a rock composed of broken rock fragments). In this case, the components all have the same high iron content (H) but different petrologic grades (H4-5). In the second half of the meteorite’s label, S refers to “shock stage.” S can range from 1 to 6 (lowest to highest). The S3 shock stage means that scientists observed features of the meteorite’s crystals that are indicative of incipient melting caused by sudden heating during high-speed collisions of the rock either during its history of colliding with other objects in the asteroid belt or during its passage through Earth’s atmosphere and subsequent impact. Weathering sets in quickly in meteorites. W0 refers to the weathering stage. It is 0 because it was an observed fall. But because of humid conditions, oxidation near the metal grains began quickly, as noted by scientists at the University of Arizona. This is not unusual. For example, meteorites recovered from the Park Forest meteorite shower in Chicago in 2004 and the Portales Valley meteorite in New Mexico in 1998 exhibited the beginnings of oxidation after only one week following their fall. Once meteorites fall to Earth, they are not long for this world. Jackson is at the Geological Survey of Canada in Vancouver, British Columbia. Brown is in the Department of Physics & Astronomy at the University of Western Ontario in London, Ontario. Melosh and Hill are both at the Lunar and Planetary Laboratory at the University of Arizona in Tucson.